Santel, a former college footballer turned “professional eater”, is in Newbridge, Co Kildare to take part in the 64oz steak challenge at Judge Roy Beans Bar & Restaurant. His opponent, Dermot McDermott, is a 48-year-old former Irish international boxer and local man. Each contestant tonight has one hour in which to consume a portion of chips, coleslaw, onion rings and side salad, as well as six enormous steaks weighing at 64oz in total. (The largest steaks most restaurants serve, by way of comparison, rarely exceed 20oz. 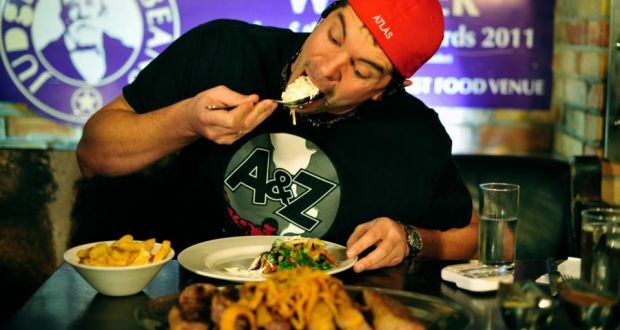 )The “sport” of competitive eating, born out of the tradition of Fourth of July hot-dog-eating contests,is as bizarre (and, some might argue, as obscene) a symptom of quintessentially American excess as monster truck derbies, child beauty pageants and foreign wars of choice. In the US, there are tournaments, a ranking system and even something called the Mustard Yellow International Belt awarded to the winner of the annual Nathan’s Hot Dog Eating Contest in Coney Island, New York. On a quiet Tuesday night in Newbridge, Co Kildare, however, American-style razzmatazz is a little harder to muster up. Santel’s pre-game patter is peppered with adjectives such as “stoked”, “psyched” and “awesome”. But the mood among the dozen or so onlookers gathered is one of bewilderment. Go! The contest is under way. The Missourian attacks carbohydrates first, inhaling his pile of battered onion rings like they were candyfloss. McDermott, by contrast, opts for a meat-first approach. He is the head doorman at the pub next door, and has no background in competitive eating: he was cajoled into taking part tonight on a bet. The first inkling he has, McDermott later reveals, that a home win might not be on the cards tonight, comes about 15 seconds into the contest, when Santel squeezes his entire portion of chips into paste between his palms, then gulps it all down almost without taking a breath. The crowd is gobsmacked. McDermott looks shell-shocked, his first slice of steak still dangling uneaten on his fork. This may be the most depraved piece of performance art any of us has witnessed. Though I only take my eye off the American for a second, when I turn back, Santel’s entire helping of coleslaw has also vanished. I’m not sure if he ate it with his hands, or gargled it down with the hot garlic butter provided. Sensing audience enthusiasm for this contest is already waning, the DJ begins to interject on the microphone, urging us to give the contestants our support. Five minutes in, Santel’s side dishes are all devoured. Fork clasped in his left fist, steak knife sitting in his right hand, he shreds the meat lengthways from top to bottom. He gobbles the fat too, but separately from the meat, presumably to cope with the variation in consistency. He’s cruising now. On the PA system, the DJ is playing Bruce Springsteen’s Born in the USA. On the PA system, the DJ belts out You’ll Never Beat the Irish and the crowd join in. I’m not sure I’ve never heard the song performed as ironically – and I was at Euro 2012. Both contestants are now sweating profusely under the lights. Santel in particular is hacking and sneezing into a napkin. This is the part you don’t see on Man v Food. Virtually every spectator present is filming the spectacle on their mobile phones. But frankly, I can’t imagine wanting to sit through it again. Finally, Santel throws down his cutlery and holds up his stainless steel plate for the cameras. Nothing remains on it but tiny meat particles, hacked into lint, while a small stream of red drips down on to the table below. This wasn’t a meal, this was a bloodbath. After posing for photographs, Santel repairs to the front of the bar for a drink. His college football career was looking promising, he tells me, until injury ended any hopes of turning professional. As a lineman, he had weighed 25 stone. In retirement he dropped down to 15 stone, winning Men’s Health magazine’s National Body Transformation contest in the process. While out celebrating, he and a friend polished off a 28-inch pizza in St Louis, Missouri, and pocketed $500 for their troubles. Out of work and out of options, Randy Santel saw a new calling. He has since won 142 contests in his native country and tonight was the first night of a whistle-stop European tour, in which he will compete another 30 times in 44 days. We head back to the bar, where REM’s Everybody Hurts is now playing on the PA. Less than five minutes of the hour are remaining, and McDermott still has two full steaks and a bowl of chips left to go. I talk to Santel’s sister Shelley, who is accompanying him on the trip. Her opinion of competitive eating as a sport, I would guess, is not very different from my own. But she loves her brother and she can see how much this means to him. Adam Richman stepped down from Man V Food after three series, reporting that weight gain had left him depressed, and lamenting the public perception of him as a “human Dyson”. Does that really sound like Santel’s dream job?